Casa Herrera has been in R&D on its 52 X 52 flour tortilla press for over two years. Extensive analysis of stress and deflection have been done by a Professional Engineer. This analysis required numerous design changes to minimize stress and deflection thus assuring the flatest platen surfaces currently available in the industry. Flat platens make round, even sized tortillas. Some of our available features are listed below. The system has a separate pump to handle the Kidney Loop to filter and cool the hydraulic fluid any time the press is powered up. It also continuously monitors particle size of the hydraulic fluid to alert the operator of any potential issues. 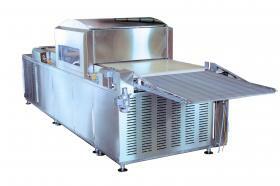 The system has state of the art hydraulic control for speed and accuracy. Another unique feature of the new design, is the fact that it uses four cylinders to press the tortillas. The hydraulic control allows the operator to adjust each cylinder independently up to five thousandths of an inch while the press is in operation. A push of a button on the touch screen will allow this adjustment in one thousandth of an inch increments with each press of the button on the screen. 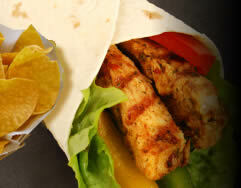 This allows maximum control when running some of those difficult to manage recipies such as low carb. 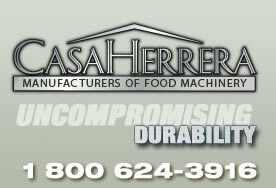 Casa Herrera has recently moved to the new Automation Direct Productivity PAC 3000 series micro processor. This is one of the first combinations of a PLC and a PC in one package. It is extremely fast and can do a scan of a complete production line, for validating operating parameters, in less than one millisecond. This informs and alerts the operator of any issues while they are correctable and not catastrophic. Casa Herrera typically continuously monitors over 100 critical points on the complete line during production. This processor allows us to accomplish that monitoring with ease in less than .6 miliseconds. The diagnostic features of the new system are a real asset to the maintenance staff in charge of maintaining the system. There are screens on the I/O modules that show status on a continuous basis. They are also integrated into the touch screen. The modules are fused and can show if a fuse is blown on which module as well as its location and many other features. We were extremely pleased by the features of the new system and to be able to offer them all to you. 3,240 to 3,600 Dz/H of 6" tortillas. 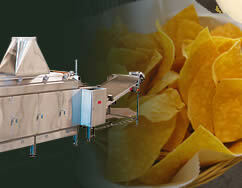 2,160 to 2,400 Dz/H of 8" tortillas. 1,440 to 1,600 Dz/H of 10" tortillas. 810 to 900 Dz/H of 12" to 14" tortillas. 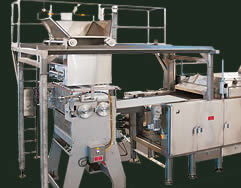 Production can be doubled using a double drop system. ** Maximizer needed to achive the higher capacity.